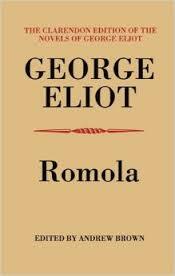 I just finished reading George Eliot’s Romola in the Clarendon edition edited by Andy Brown. In his Introduction Andy provides some interesting information about the contract for the book. £10,000 represents over a million dollars at today’s values, but George Eliot turned it down. She gives her reason as timing: “The idea of my novel appearing in the Cornhill is given up, as G. Smith wishes to have it commenced in May, and I cannot consent to begin publication until I have seen nearly to the end of the work.” Eventually, after writing a bit more of the book (8 out of 74 chapters only though), she did agree to let the Cornhill do it, with a later start date, and for $7,000 only (still about $850,000 now). Smith Elder also got the exclusive right to publication in book form for six years, and the right to keep in print one edition of their choice after that. George Eliot obviously had sales power, but “£7,000 was almost twice what she earned from The Mill on the Floss, and not much less than she had hitherto made from all her previous novels put together.” Her previous novels were: Scenes of Clerical Life (really a collection of stories), Adam Bede and The Mill on the Floss. Silas Marner was published before Romola, but its composition interrupted her writing of Romola. The fact that Lewes was offered, and (somewhat reluctantly) took on an editorship role at the Cornhill as part of the deal is perhaps a complicating factor. Whether he really pushed Polly to go for the big bucks or not, as Blackwood suggests, is not clear. What to make of these shenanigans? Seems we moderns have nothing new to show of spendthrift and borderline devious proceedings. Blackwood’s did eventually publish an edition of Romola, initially to go in a collected edition, and were also the publishers of Eliot’s subsequent books, so all ended well for them despite their grumpy forebodings. Can Smith Elder’s deal have been a sensible one? We know the three-decker was remaindered, so let’s assume 2,000 of the 2,288 copies printed were actually sold, for a total revenue of about £2,030. In its first ten years the 6s. then the 2s. 6d. edition would have brought in about £1,975. (Having no real idea, I have assumed an average discount of 33.33%, which I bet is actually a bit high). Whatever proportion you think Smith Elder would have assigned as author’s cost (royalty in a conventional modern contract) the fact that their total revenue fell below the amount they paid to the author by £2,940 represents a pretty disastrous loss. Of course they may in spite of all indications to the contrary have considered its contribution to the Cornhill‘s survival as an important factor: if you write off even £2,100 (Thackeray’s fee) as a Cornhill editorial debit, we still haven’t broken even, and we haven’t yet counted the cost of printing and binding the books and paying for the illustrations by Frederick Leighton. However Smith Elder survived till 1916 when it was merged into John Murray’s, so the damage wasn’t fatal. Of course all publishers make such mistakes all the time: the business is a crap shoot.